base 2 must be raised to create the answer of 8, or 23 = 8. In this example, 8 is called the antilogarithm base 2 of 3. Try to remember the "spiral" relationship between the values as shown at the right. Follow the arrows starting with base 2 to get the equivalent exponential form, 23 = 8.
for b > 0, b≠ 1, logb x = y if and only if by = x. The log bx is read "log base b of x". 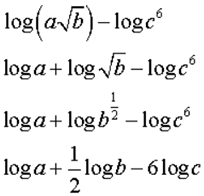 Logarithms with base 10 are called common logarithms. When the base is not indicated, base 10 is implied. Take common log of both sides. For help with logarithms on your calculator, click here. Using the properties of exponents, we can arrive at the properties of logarithms. Similar investigations lead to the other logarithm properties. working with the natural log. If using your calculator, remember to use the change of base formula and enter log 1 / log 3. 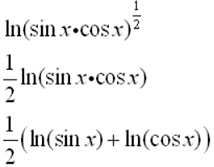 Using properties of logs, solve for x.